Gina, Thank you again for the reading yesterday. I needed some closure from my grandmother’s sudden death and I feel I achieved that in the reading. After I left yesterday I was smiling because it felt like I had just had a conversation with my grandma. Rich was thrilled that I heard from his grandfather. He cried immediately but then smiled hearing him come through and be so specific. I can’t thank you enough for what you did using your special gift. Readings are divinely guided and channeled by Spirit, connecting you to your loved ones that have crossed over to the other side. Their souls always want to provide the most loving and healing of messages that they are still with you, validating that even though they have crossed over, their bond of love remains with you for all of eternity. Messages are always very clear… I am here and have not left you. Through channeling of your own Angels and Spirit Guides, messages are shared to help assist you in understanding your life’s events, lessons and circumstances that have been brought to you for your soul’s learning in this lifetime. Spirit will provide guidance surrounding career, relationships, health, finances and your ultimate purpose. The intention of the reading is to help set you back on the path of learning as to why you’re here, helping to connect you back to your God-given gifts, and guiding you towards manifesting your best life… your joy, peace and well-being. For a more intimate and private setting, groups of 4-7 people are held in Gina’s office. Groups are conducted in open group format, but are kept small so each person will receive messages in a cozy environment. No private, individual readings given for small groups. Please contact for availability and additional information. Larger groups can be conducted in your home or office for 10-15 people. You must guarantee a minimum of 10 people in order for Gina to travel. Groups are done in open group setting. No individual private readings available for home groups. Please contact for availability and additional information. Messages from Spirit can be conducted for larger groups at restaurants, seminars, workshops, events and retreats. Please contact me for additional information. Learn more and schedule a Group Reading. Readings provided by Gina are for guidance only and are intended to offer insight into your personal life. All healing sessions, readings and questions answered by Gina does not in any way constitute medical, legal or financial advice and are subject to your own interpretation and judgment. Your decisions, including any actions you take, with the information that Gina offers in a reading, or provides in a healing session, is based on your own personal responsibility and choice. 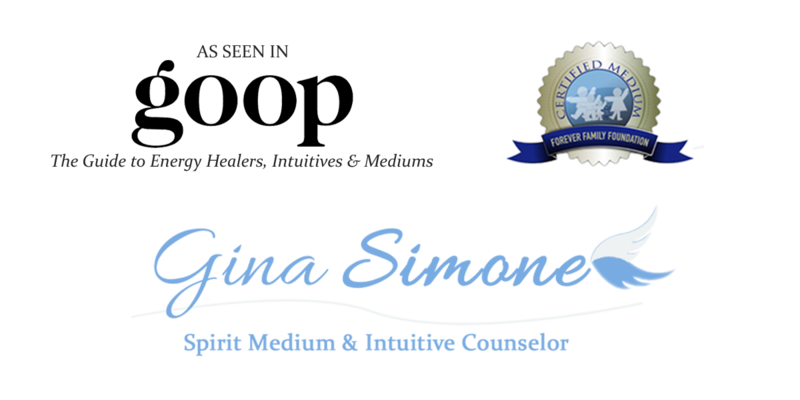 Gina Simone will not be held liable for any damages resulting from the use of this website or as a result of any reading, healing, class, event or session with her. For legal reasons, we must advise you that the readings are for entertainment purposes only. Services provided by Gina are not a substitute for professional advice, and it is advised that you seek assistance from the relevant qualified expert.